TLAHUELILPAN/MEXICO CITY, Mexico (Reuters) - Mexico's new government knew a pipeline was leaking but did not act for hours before a blast killed at least 85 people, a minister said on Sunday, increasing scrutiny of a push to stop fuel theft seen as the president's first crackdown on crime. State oil firm Pemex did not close the gasoline pipe when first notified by the military, about four hours before Friday's blast, because it considered the leak "minimal," Security Minister Alfonso Durazo told a news conference. Relatives of some of the victims said fuel shortages stemming from President Andres Manuel Lopez Obrador's plan attracted people to the leak at the Tula-Tuxpan pipeline, a few miles from a major refinery. 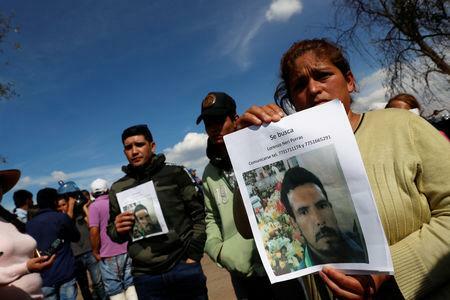 "A lot of innocent people came here, perhaps their car didn't have enough gasoline for tomorrow, and they said: 'I'm just going to go for a few liters'," said farmer Isidoro Velasco, 51, who said his nephew, Mario Hidalgo, was probably killed. When questioned about why it took so long to close the pipe's valves after the leak was detected, Durazo said Pemex followed protocol. The explosion occurred half an hour after Pemex closed the valve, he said, because high-octane gasoline remained in the pipe. "I won't take a single step backwards," he said at the first of two news conferences. "I can only offer people apologies, if this action causes sacrifices, harm and inconveniences." If successful in uprooting a parallel fuel network that siphons off about $3 billion worth of fuel from Pemex each year, the veteran leftist who won last year's election on promises to root out endemic corruption will have scored a big early victory, strengthening ailing national oil company Pemex and helping stabilize fuel prices. Failure would likely not only erode his popularity but pose risks for the economy, the world's sixth-biggest fuel market.